This immaculate, well equipped ski /summer chalet is just minutes from BOROVETS ski resort. Run by English speaking Nikki Chakalov and his wife Marian. Nikki has been a Ski Instructor for many years at Borovets and will ensure you get the best out of your Ski holiday. Ski/snow packages and ski hire can be arranged at the chalet and instructors speak either English, German, Dutch or Russian. Transport to ski slopes is included in ski package. (2euros per day if not booking ski package) BREAKFAST is included in the price. Home made evening meals can also be provided in the large dining room/bar area. 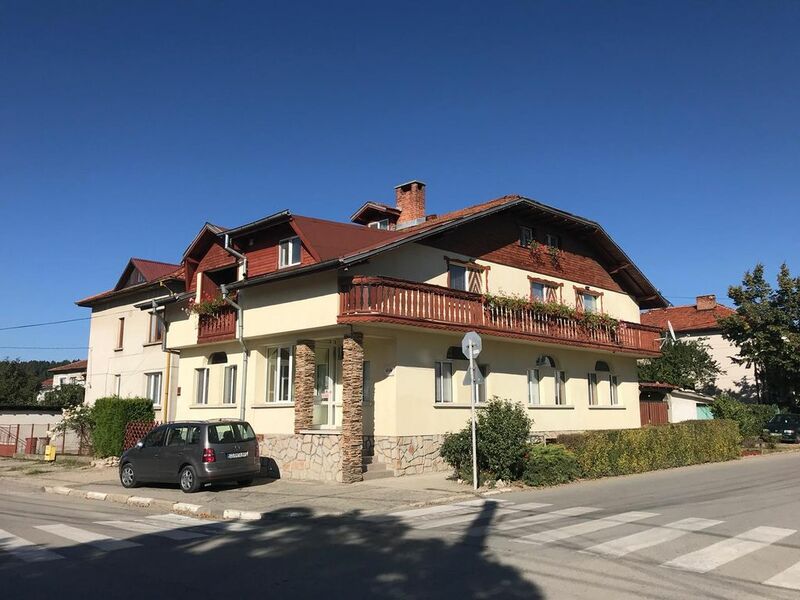 The chalet is close to the centre of the town of Samokov with many inexpensive restaurants, bars and nightclubs within walking distance - local knowledge of all the best deals in town freely given!! The ski chalet is modern, with ensuite rooms. MASSAGE, JACUZZI & SAUNA available. GROUP BOOKINGS WELCOME. Airport Transfers can be booked in advance - 1 hour from Sofia airport. Rent a car. My family and I have just returned from an amazing stay in this super chalet. We are all pretty much beginners and are so, so pleased that we chose Nick and John to teach us. Letting these two (Bulgarian and English) gentlemen take the strain of our skiing adventure was 100% the key to an awesome holiday. We felt supported and encouraged with humour and kindness, and had their full attention every day. After a warm and comfortable night's sleep we woke and had a delicious breakfast (which was fit for a king!) and a short, comfortable transfer to the slopes at a time to suit us. Nick and John enthusiastically skied with us right up until the last lifts. These two are equally as brilliant with kids as they are with their occasionally nervous mums, and we all progressed fantastically well in our skiing under their instruction. I would completely and without reservation recommend this place and the lovely family that run it. If you want a family ski holiday, minus the stress, and with first class, attentive instructors then this is it. Αυτή τη φορά σκεφτήκαμε να μείνουμε στο Samokov , ήταν η πρώτη μας φορά που μείναμε στο Chalet. Η τοποθεσία είναι άριστη καθώς συνδύαζει το χιονοδρομικό με την πόλη του Samokov όπου έχεις πιο πολλές επιλογές όσον αφορά αγορές,χαμηλότερες τιμες,φαγητό κλπ. Τεράστιο θετικό είναι ότι η τιμή/νύχτα περιλαμβάνει μεταφορά στο χιονοδρομικό (10 λεπτά απο τα slopes) ,πρωινό,σάουνα και τζακούζι! Θετικό είναι επίσης ότι προσφέρεται κατόπιν συνενόησης μεταφορά, απο το αεροδρόμιο στο chalet. Εμείς πετάξαμε απο το Ελευθέριος Βενιζέλος και ο Nick μας περίμενε και μας μετέφερε στο Chalet. Υπάρχει οικογενειακό κλίμα στην επιχείρηση , ο Nick, ο οποίος είναι και δάσκαλος του σκι, και η σύζυγός του ήταν δίπλα μας σε ότι κι αν χρειαστήκαμε. Μας καθοδήγησε σχετικά με τον καιρό και ήταν πολυ καλός και υπομονετικός με τα παιδιά,όσον αφορά τα μαθήματα σκι. Επίσης μας έδωσε πολύ καλύτερες τιμές όσων αφορά την ενοικίαση του εξοπλισμού συγκριτικά με τις τιμές του χιονοδρομικού ή άλλων καταστημάτων στο Borovets. Το συνιστώ ανεπυφίλακτα σαν top value for money! Θα σας επισκεφτούμε ξανά σύντομα. Ευχαριστούμε πολύ όλη την οικογένεια. Υπέροχη διαμονή και εξυπηρέτηση! This was our third time to stay at this chalet. We rented the family room with our 2 boys age 14 and 11. Nick taught our boys. He is a great instructor. Our youngest son needs extra help and Nick has risen to the challenge each and every time we have visited. He has shown exceptional patience and has made learning to ski such good fun for our boys. He has good contacts too and enabled our eldest son to have a snow board lesson with one of the national champions. He absolutely loved this and learnt lots. The breakfasts are individually cooked and are exceptional - a great set up before the expenditure of lots of energy! Nick transported us everywhere (to and from the slopes each day, to the local money changer, to the local restaurants and so on) and nothing ever seemed too much trouble. The communal area is comfortable and there is an honesty bar which is useful. Staying and eating out in Samokov is considerably cheaper than Borovets and I think the quality is much higher too. Nick has a friendly personality and is informative about the skiing and the area. We cannot recommend this chalet enough and will hopefully be returning next season for more fun on the slopes. This is truly a gem in Bulgaria with exceptional accommodation and most of all, exceptional and attentive service from people who really want you to have a wonderful holiday. An incredible host & Chalet - a wonderful stay! Nick and his family are in more than hospitable and made our entire group of 14 people plus three babies feel at home. His chalet is fantastic with lots of room, and as many have stated before breakfast alone is worth going back for. Pickup and drop off at the airport in Sofia was easy and the meals out in Samakov were very memorable! All arrangements were attended to! Nick was awesome with my wife and daughters on the ski slopes and was ready to teach an old dog like me a few things on the hills as well. Equipment and transport to and from the hills was easy and organized to a tee. I can't say enough good things about our week (we have booked already for 2017), the beer was great too. Cheers to you Nibk and family. See you again soon. We had the most fantastic time staying at Four Seasons with our wonderful hosts Nick and Mariana. We booked this holiday based on the reviews that we found on line and were looking for something different. Nick collected us from the airport and took us back to chalet where we were welcomed with a cold beer and hot soup! The basement is stocked with all the equipment you will need for skiing, which we hired from Nick. So much easier than trying to do this in town, it was all so relaxing! We booked a family room for us and our two kids. Incredibly spacious and comfortable with ensuite bathroom, immaculately clean too. Nick booked us into a wonderful local restaurant just down the road from the chalet and we had a lovely meal on our first night (excellent value too). The next morning we enjoyed a delicious breakfast (as we did each day) cooked to order by Mariana - we all loved the homemade pancakes! Nick was also our ski instructor each day. We were a mixed bag, me fairly competent, but nervous, our 10 year old son who wanted to get from the top to the bottom as fast as possible and our 6 year old daughter complete beginner. Nick is kind, patient and great fun. We have all come on so much in this week with his help. He has also got great knowledge of the mountains and local area so knew where would be best to go. It all just worked perfectly and meant that the whole family enjoyed each day. There is also a jacuzzi and sauna at the chalet which was much needed after a day on the slopes. Thank you so much to the lovely Chakalov family. We can't wait to come back next winter, I'm already looking at flights! Highly recommended and great value. If you stay at Four Seasons you will not be disappointed! We cannot recommend this chalet highly enough. The customer service is first class. Nick is a friendly and practical chap who always had a smile and a joke at the ready. He was relaxed but focussed. His wife Mariana was cheery and helpful. The chalet was very attractive and well laid out. We rented the family room with our 2 sons, age 12 and 9. We were impressed with how spacious the 2 adjoining rooms were. The bathroom was modern and the water was always piping hot. We tried out the Jacuzzi which was fun and very relaxing. We were impressed that the rooms were cleaned each day and dry towels were provided. The food was of a high quality and the honesty bar is such a good idea as it allows you to mix with other guests informally over a drink. We were often very tired in the evening and Nick helped us out by giving us lifts home from the local restaurants. Nothing seemed too much trouble for him. Nick taught 3 of our party and, due to his personal attention, their progress was staggering. Most of all he taught them to have fun skiing! Nick was always happy to share his local knowledge. He is obviously well respected and connected. He was happy to show us the best restaurants and shops to browse and we both bought new ski gear as it was so reasonably priced. We found Borovets to be quite touristy so it was quite refreshing to be in a nearby town where tourists are few and far between. The local restaurants are excellent and amazingly good value. One of them in particular was like a stately home with beautiful furnishings. We ate out for about £20 each night for 4 of us with drinks and desserts. We were incredibly lucky with the snow conditions as there were about 250cm and it practically didn't stop snowing. Overall I would say the best thing about this chalet is the hosts. Nick and Marian obviously want each and every customer to have a special time and we certainly did. My son knew that we were writing this review and said to me "make sure it's good mum". We hope to return next season and are trying to get friends to come with us. Thank you Nick and Mariana for making our stay such good fun and so memorable. Four Seasons Ski Chalet is just 10minutes away from main ski resort of BOROVETS in the Rila Mountains. Within walking distance of the centre of the town of Samokov.There are many restaurants, bars and nightclubs with prices well below those of Borovets. Samokov is a bustling town with both a daily market and larger weekly market where you can buy locally grown produce. Check out the small shops selling any number of interesting items at extremely good prices. The Rila Mountains, within the National Park, are a haven for wildlife, plants and fantastic walks. Rivers, fed by the mountain waters provide a magical place for barbecues and picnics. The famous Rila Monastery is well worth a visit. For those who love music, cafe society and designer shopping a visit to Sofia is a must. The journey down the winding mountain road will take you past Lake Iskar with its beautiful mountain backdrop which you can enjoy whilst sipping a local beer. Winter snow, summer sun and all at a small price!